On Wednesday 16th October Mary Ward and Jo Collins, the founders of the Chickenshed Theatre, were interviewed by BBC Radio 4 presenter Jenni Murray on Woman’s Hour. They were invited onto the programme to celebrate the forthcoming 40th anniversary of a theatre which was set up to involve young people in theatre, irrespective of their abilities. Both founders had a shared belief that they could produce excellent theatre with young people if they could encourage everyone to accept what young people bring, rather than what they don’t bring. They argued, for example, that young people are often much less judgemental about other young people with disabilities than adults are: they simply accept the disability as a given and proceed from there, without fuss. They argued that discrimination is a learned, social behaviour. That commitment, and the continuous improvisational ability to involve other people in the undertaking, has created an institution which has lasted 40 years although it has never received Arts Council funding. This entry was posted in emergence, planning, strategy, time, Values and tagged Chickenshed Theatre, innovation, planning, pragmatism, Values, vision and mission on October 18, 2013 by Chris Mowles. Anyone who has enjoyed this blog may be interested in reading this book, which has just been published. Add the book to your basket by pressing the Add to Basket button. * Press the Update Basket button and you will see the discount applied to this title in your basket. * Proceed through steps 2-4 to confirm your order. 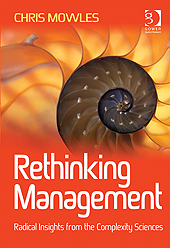 This entry was posted in complexity, emergence, ethics, management, reflexivity, strategy, Uncategorized, Values and tagged complexity and management, complexity sciences, management, organisational research, reflexivity on September 12, 2011 by Chris Mowles. • Alzheimer’s sufferer Mrs J, 82, whose husband was denied the chance to be with her when she died at Ealing hospital in west London because he had been “forgotten” in a waiting room. • Mrs R, a dementia patient, who was not given a bath or shower during 13 weeks at Southampton University Hospitals NHS trust. She was not helped to eat, despite being unable to feed herself, and suffered nine falls, only one of which was recorded in her notes. • “Feisty and independent” Mrs H, who had lived alone until she was 88, was taken from Heartlands hospital in Birmingham to a care home in Tyneside but, when she arrived, was bruised, soaked in urine, dishevelled, and wearing someone else’s clothes, which were held up with large paper clips. This entry was posted in complexity, ethics, health care, inclusion and exclusion, judgement, mutual recognition, paradox, power, Uncategorized, Values and tagged dying, Health ombudsman, health reforms, NHS, Norbert Elias, power relations on February 17, 2011 by Chris Mowles. Increased competition, endless tendering for contracts, cuts to service, downsizing, paying people less: these are the things that a group of directors from a not-for-profit organisation supporting vulnerable people in the community tell me they have endured during the last three or four years. Although contractors, usually local authorities or public health bodies, want greater and greater quality, they pay less and less money for it. This is what ‘efficiency’ in the provision of community-based services has come to mean. An experienced worker supporting many vulnerable people in the community with complex needs might take home £17k a year, and then might need a second job in order to earn enough money to support themselves. This entry was posted in complexity, health care, leadership, mutual recognition, organisations, recognition, reflective practice, reflexivity, Values and tagged competition, financial crisis, improvisation, reflective practice, strategy development, tendering on October 3, 2010 by Chris Mowles. This entry was posted in complexity, emergence, ethics, inclusion and exclusion, mutual recognition, power, recognition, Values and tagged AoM Montreal, caring, doing good, politics, power, recognition on August 16, 2010 by Chris Mowles.